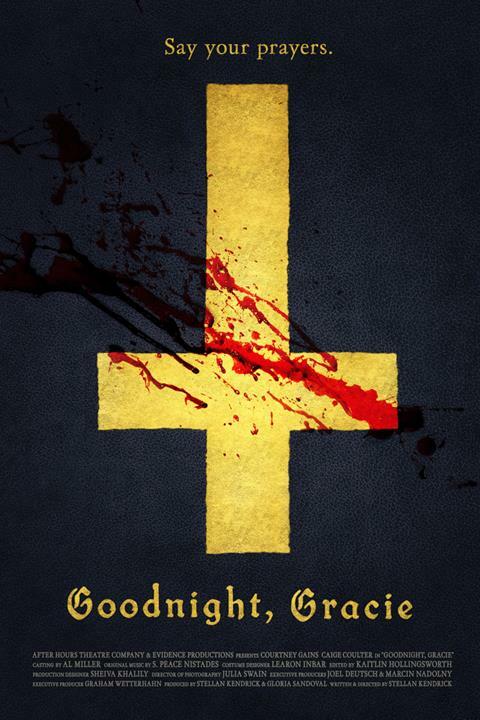 After a successful run screening at 100 film festivals receiving more than 40 awards and nominations, the Sitges Film Festival short "Goodnight, Gracie" will have its much anticipated online release on ALTER, a new free-to-watch horror platform for novel and grounded stories. The gory 3-min film, starring Courtney Gains (Children of the Corn, The ‘Burbs),written and directed by Stellan Kendrick, produced by Kendrick & Gloria Sandoval, and executive produced by Graham Wetterhahn went live on October 30 at 9.:00 a.m. PT in time for Halloween. “Our festival run exceeded our wildest dreams, and we can’t wait to share this terrifying short film with you thanks to our friends at Alter,” director Stellan Kendrick said. “After being in over 95 festivals over the past year, I am excited we are now able to show our powerful short film ‘Goodnight, Gracie’ to the world! Enjoy horror fans enjoy!” star Courtney Gains said. In "Goodnight, Gracie" a devout child is awakened by her mother's scream, and after investigating realizes she must fight to escape the same fate. "Goodnight, Gracie" seeks not only to entertain with suspenseful moments and stimulating visuals, but to strike at thematic undertones that can only be explored through metaphors of horror. Until then, say your prayers. Starring Caige Coulter as Gracie, Courtney Gains as Billy, Zoë Simpson Dean as Mom and Brad Goodman as Dad, Goodnight, Gracie is written and directed by Stellan Kendrick, produced by Stellan Kendrick & Gloria Sandoval. Lead Executive Producer: Graham Wetterhahn. Executive Producers: Joel Deutsch& Marcin Nadolny. Director of photography: Julia Swain. Production Designer: Sheiva Khalily. Edited by Kaitlin Hollingsworth. Casting by Al Miller. Costumes designed by Learon Inbar.